Mussels or Tahong Soup is quite the simple soup to make. All you need is garlic, onion and ginger and you are good to go. Rice washing(hugas bigas) is commonly used for the soup base, but tap water still gives you the same cloudy white soup. 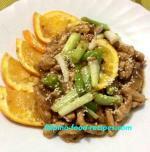 It is usually topped with hot pepper leaves. A word of advise, though, when preparing a mussel dish. Even if this mussel soup is fast and easy to cook, it is cleaning of the mussel that you need to be thorough, otherwise, you could end up with sand and grit on your soup. Depending on where you buy your mussels, the shells need to be scrubbed clean. The beards hanging out of the closed shells need to be pulled out. They have to be washed with several changes of water until the water runs clear. And to ensure that you don't munch on sand with your mussel soup, pour the cooked soup onto a separate pot, leaving a half cup of broth with any sand or grit that didn't come off during washing. 1 Using a stock pot, saute the garlic, onion and ginger until fragrant, about 3 minutes. 2 Add the fish sauce, then add the water and bring to a boil. 3 Put in the mussels and cook until the shells open. 4 Add the hot pepper leaves and season with salt and pepper. 5 Turn the heat off, then pour to transfer to a different pot, leaving some of the broth with any grit and sand at the bottom of the first pot. 6 Serve hot with the rice. When serving shellfish, portion in terms of pieces rather than weight. 6 pieces per person may seem plenty because of the bulky shells but might not be filling enough as the meat inside are so tiny. Discard shells that didn't open up, they might not be safe to eat. 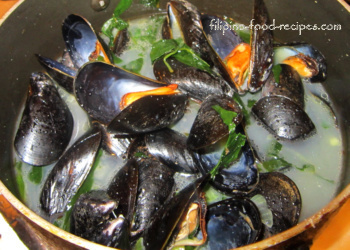 If you are not cooking the tahong or mussels right away, store them in the refrigerator submerged in water. These are live seafood that needs to stay like that until you cook them. But try not to keep them in the fridge for long. Remember, if they don't open up during cooking, they may have been dead and not safe to eat.